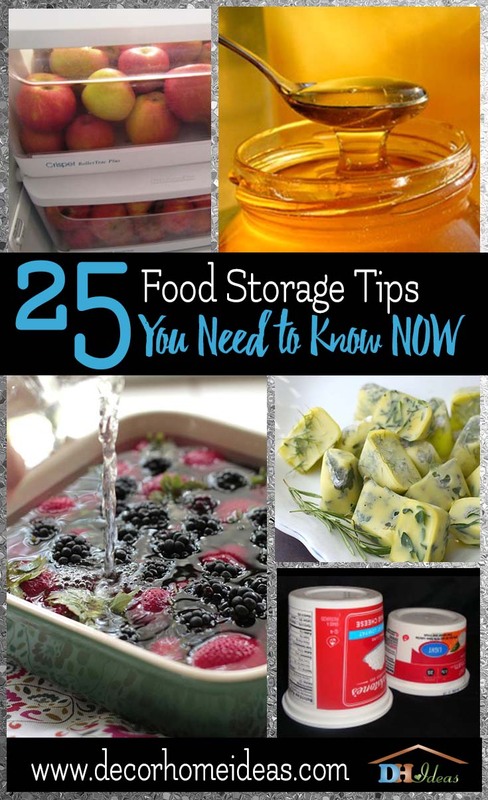 These food storage tips are genius and you need to use them as soon as possble. You’ll blame yourself for not knowing them ealier. Buying food in bulk can be a great way to save money on your family’s food bill but the savings can go in the trash with the spoiled berries if the items aren’t stored properly. Smart shoppers get in on the dollar savings by purchasing large quanitities of items and then knowing the special tricks to keep food fresh longer. We’ve collected some of these storage tips to keep your groceries–from apples to zucchini–fresh for an extended time. 1. Eat an apple a day–for six months! 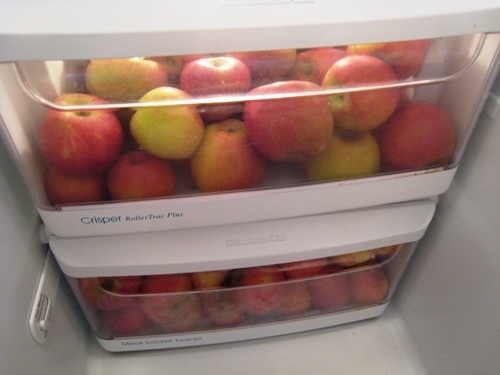 Apples love a crisp spot in a humid environment at 30-35*F. Just tumble them into the crisper drawer of your refrigerator and they’ll be happy for at least six months. Just be sure to take out any apples that are really bruised or rotten in any spots because they’ll affect the rest of the group. 2. This storage tip is just the berries! No one likes to bite into a mushy or moldy berry but it’s so easy to avoid. 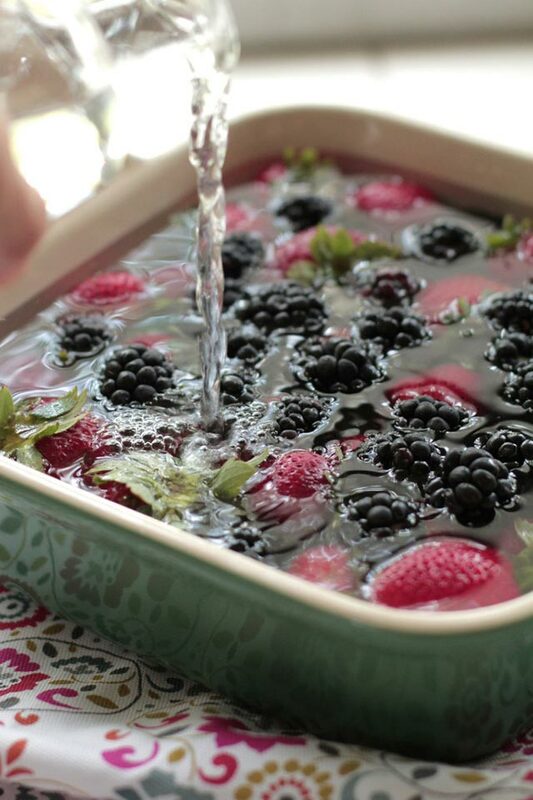 When you bring home those luscious strawberries, raspberries, blackberries and blueberries–any type of berries you like–and simply wash them with a litlle bit of vinegar in some water. Mix a solution of one ten parts of water to one part vinegar and you’re good to go. It’s also a good idead to dry your berries on a paper towel to eliminate any remaining moisture. 3. Don’t throw away your old pantyhose! This might be one of those “who would have ever thought about that” tips. 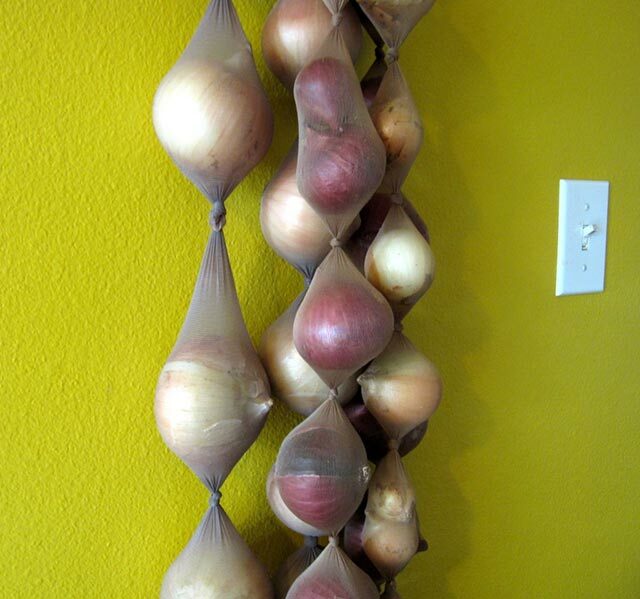 Storing onions in a pantyhose net will keep them edible for up to eight months. Simply load onions into the leg of a pair of pantyhose, one at a time, making sure to tie a knot between them to keep them separate. 4. Potatoes, apples and onions don’t play well together! They look friendly enough, but potatoes, apples and onions don’t do well when stored together. Just think of them as a few kids who need to stay separated on the playground and they’ll stay nicer for much longer apart. 5. How about fresh eggs for a year? Eggsactly! You can freeze egg yolks for a year and they’ll be farm fresh when you’re ready to use them. 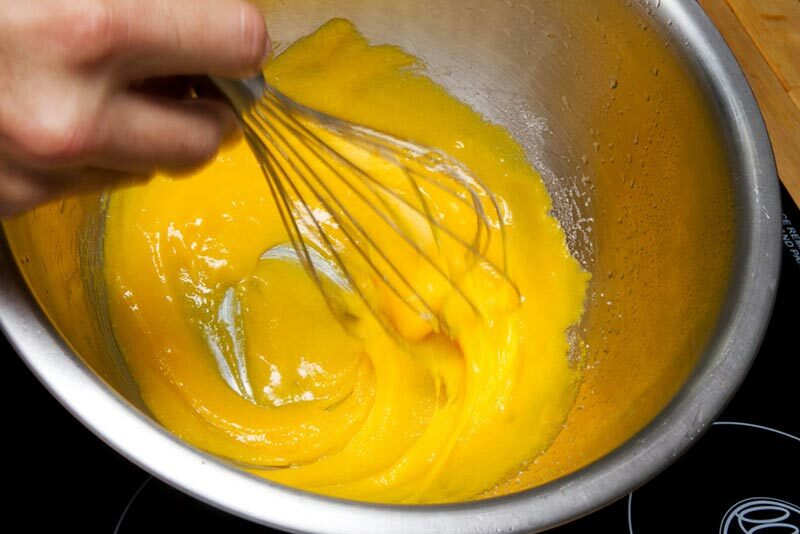 Simply separate the yolks from the whites and mix the yolks with a small sprinkling of sugar or salt. Then pour the amounts you would like into plastic freezer bags. Let’s have omelets next year! 6. At last, a honey that will stay with you forever! 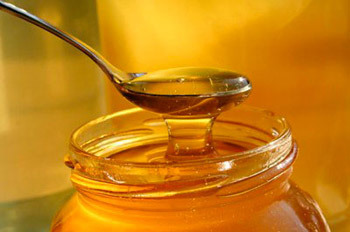 Honey may lose its amber color or become a bit solidified after it’s been stored for awhile but don’t lose heart. If you put it in an airtight jar and stash it in a cool place, it will be yours forever. 7. Tomatoes love to sunbathe! 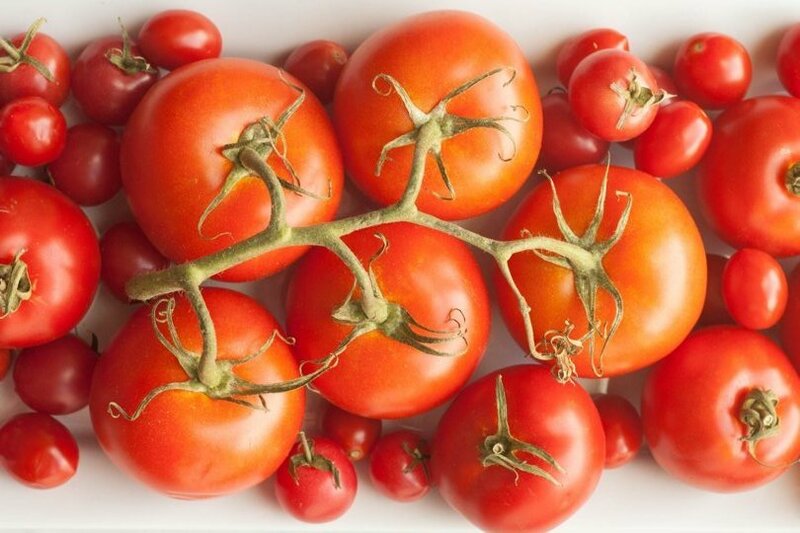 Tomatoes start out in sunny spots in the garden and they like warm spots even when they’re waiting in your kitchen. window and you’ll have a practical and beautiful addition to your kitchen! Most recipes call for small amounts of tomato paste and even tiny cans of the rich paste goes unused. Not anymore! 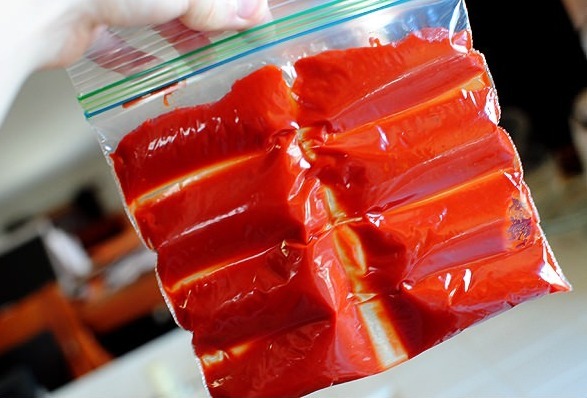 Simply put the extra tomato paste into a plastic freezer bag, making sure to portion it off in usable amounts. You’ll have delicious tomato paste to add to stews, soups and casseroles without having to open a new can. 9. There’s no such thing as spoiled milk… or grandchildren! We’ve all been taught to pay attention to the expiration on dairy products but sometimes there’s more than a little grace period on consuming them. Milk, for example, will last up to three months after the expiration date. It probably won’t retain the creamy texture it started out with but it is definitely still drinkable. If the thought of that makes you a little uneasy, take the freezer route and keep it in its original container and just pop it into the freezer. When you’re running low on milk, no need to run to the store. 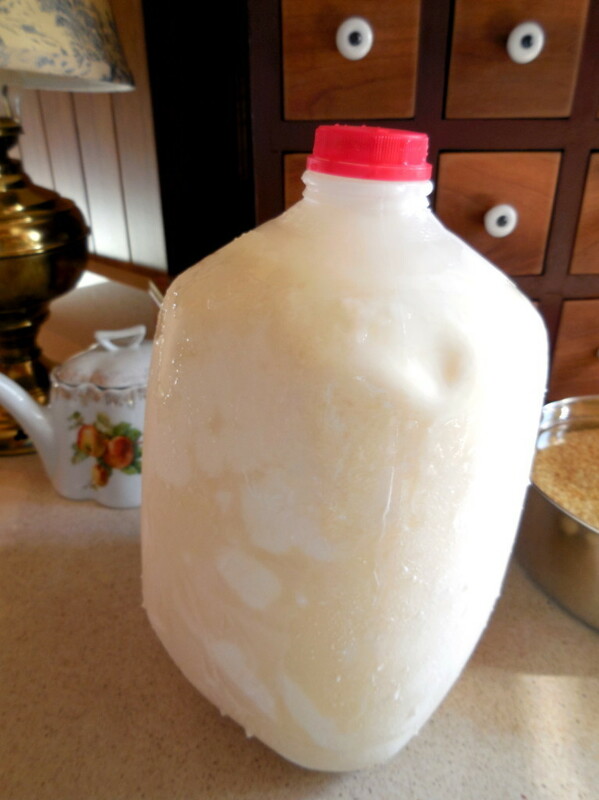 Simply thaw the frozen milk and it’s perfect for drinking and cooking. 10. Fresh herbs are always better than dried! Is there anything more delightful than an herb garden in the summer sun? Well, now you can preserve these culinary additions by freezing them in olive oil. Try placing them in ice cube trays, cover in olive oil and freeze. 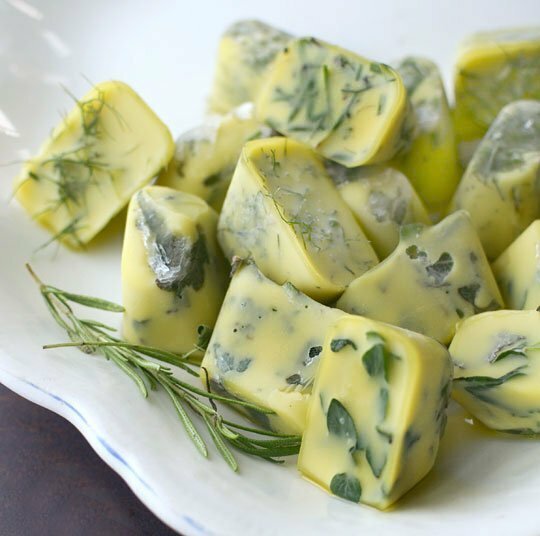 If you use your herbs in larger amount, simply place them in a plastic freezer storage bag and drizzle olive oil on them before sealing and freezing. You’ll protect them from getting brown from freezing and they’ll still retain all their color and flavor. 11. Pineapple flips storage ideas upside down! You’ve heard of pineapple upside down cake but how about pineapple upside down on the kitchen counter? 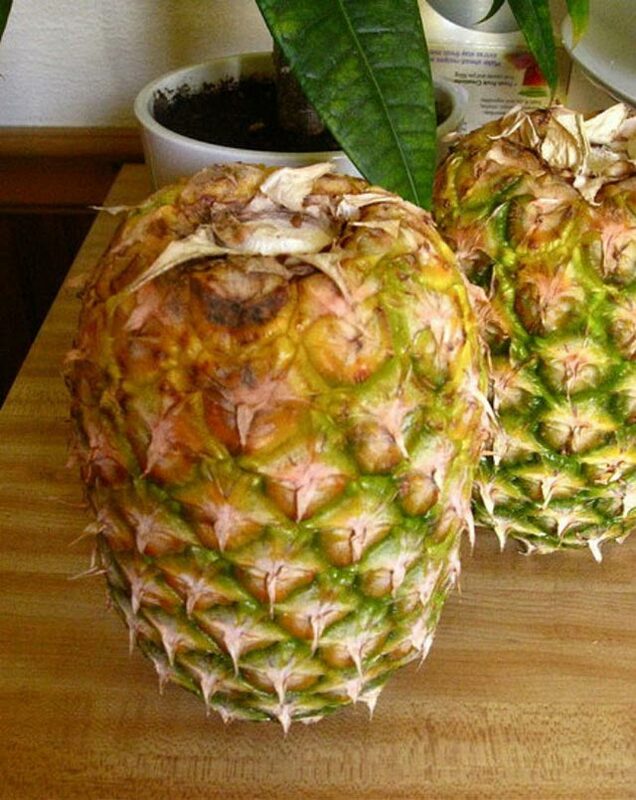 Well, that’s exactly the trick to keep pineapple fresh longer. Just pull off the stem pieces and do the flip. The sugars inside the pulp will flow back into the fruit and it will be juicy whenever you’re ready to chunk it up for fruit salad or maybe even a pina colada on a sunny afternoon. 12. Cottage cheese will flip over backward to stay fresh! This one is so fun, you’ll start a trend among your friends! 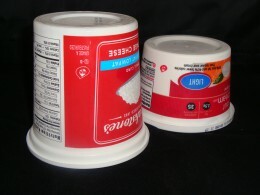 You can extend the life of a carton of cottage cheese or sour cream by simply storing it upside down in the refrigerator. When the container is flipped over, a vacuum occurs inside the carton and no bacteria can grow and ruin all that dairy goodness. 13. 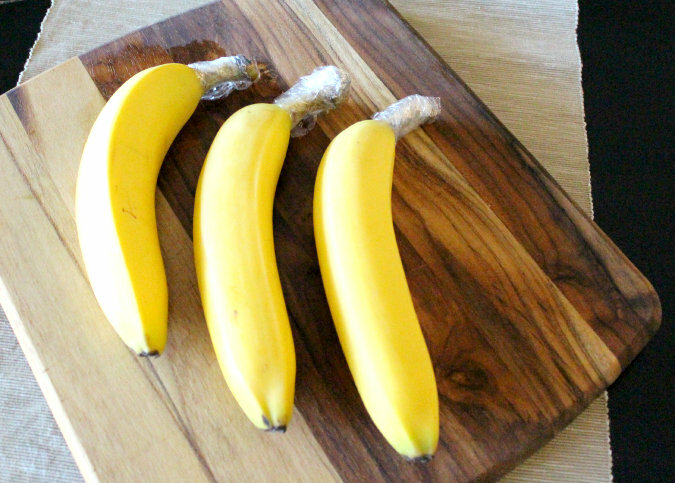 Give your bananas a shiny top hat! Sometimes it seems like the bananas you just purchased are ripe before you drive away from the market! All they need is a little attention to keep them fresher longer. Simply wrap each stem with plastic food wrap and they’ll stay bright and firm. 14. Aluminum foil keeps the crunch in! 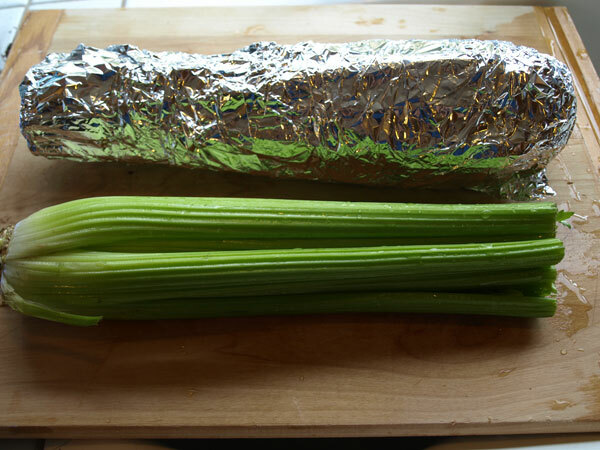 Wrapping vegetables such as broccoli, lettuce and celery in aluminum foil will keep it fresh and crunchy for at least four weeks in the refrigerator. Keep unwashed leafy greens such as lettuce and kale wrapped in a paper towel in the fridge and you’ll have crunchy salads with no wilt. 16. No such thing as leftovers anymore! Let’s face it. Industrial sized bags of veggies are great deals but you can only eat so many snow peas at a time. 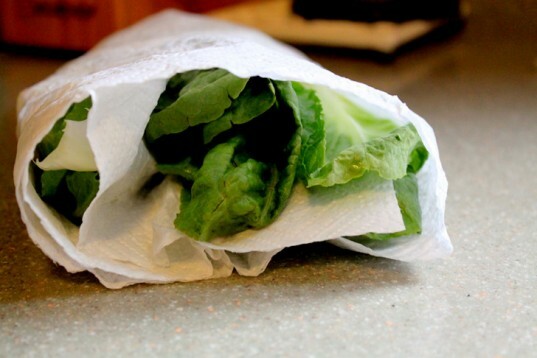 When you find yourself with too many vegetables, simply blanche them in hot water, blot with paper towels and place in plastic freezer bags. 17. 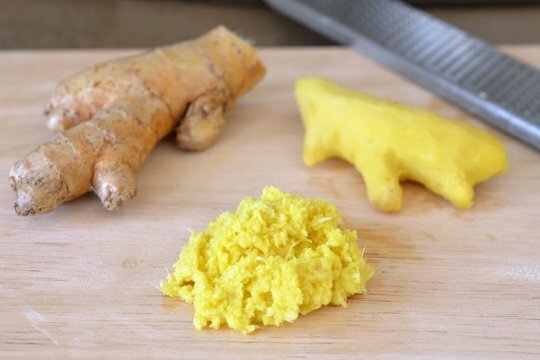 A grate idea for fresh ginger! Don’t lose ginger’s aromatic goodness. Freshly grate it and place small portions on a parchment paper-lined sheet and place in the freezer. When the little ginger stacks are frozen, toss them into a freezer storage back and back to the freezer. 18. Who hid the carrots? 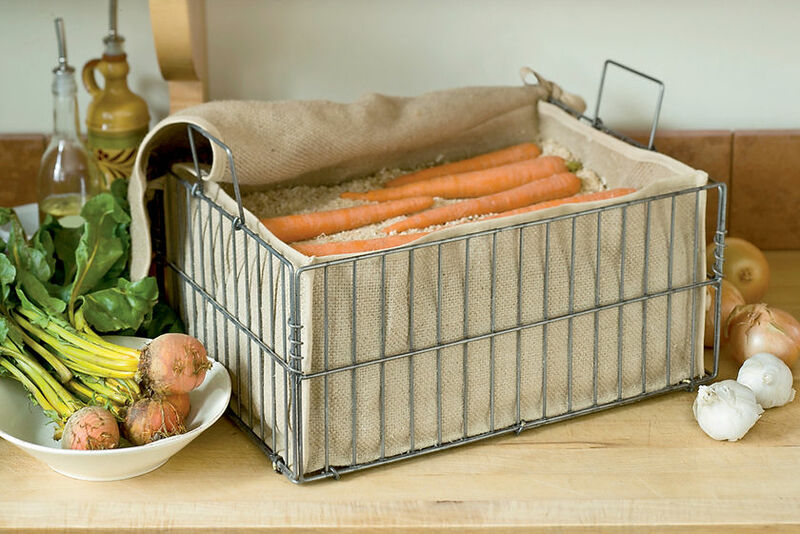 Carrots and other root vegetables like to be stored like they grew–under the dirt! If you put them in moist sand or sawdust, they’ll retain their goodness for several months. 19. Beefed-up storage for ground meat! Placing ground meat such as beef, pork, turkey, etc. inside a plastic storage bag can create unwieldy portions. 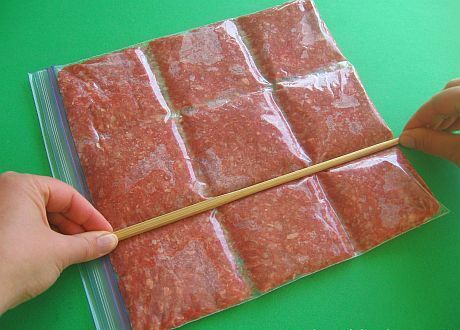 All you need to do is place the meat in a plastic freezer bag and then divide it into manageable pieces using a long spoon handle or other long utensil. 20. 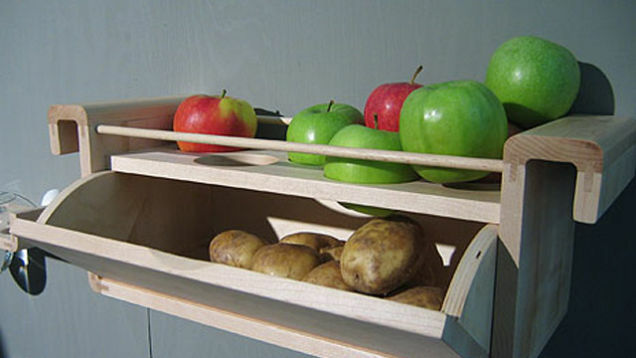 Not just another cheesy storage idea! 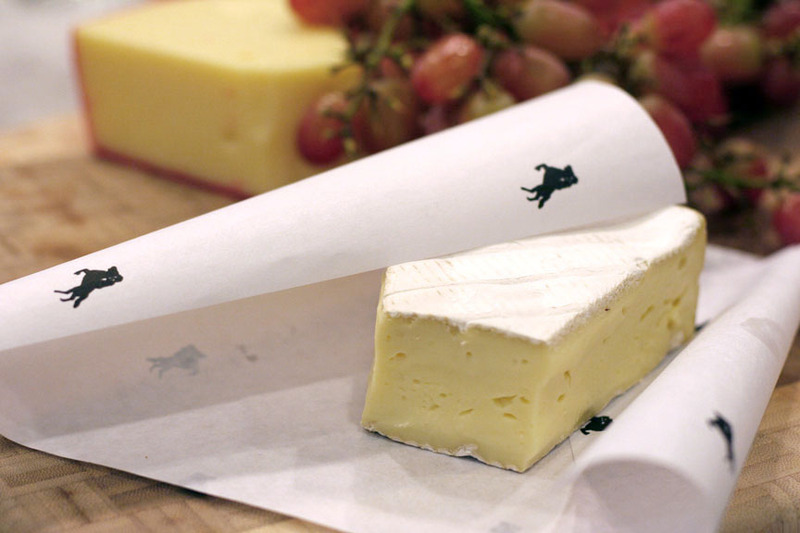 Placing chunks and wedges of cheese in parchment paper will help it stay fresher while in your refrigerator. 21. How about a fresh glass of lettuce? What’s one of the first things to wilt in the fridge? Yep, lettuce. 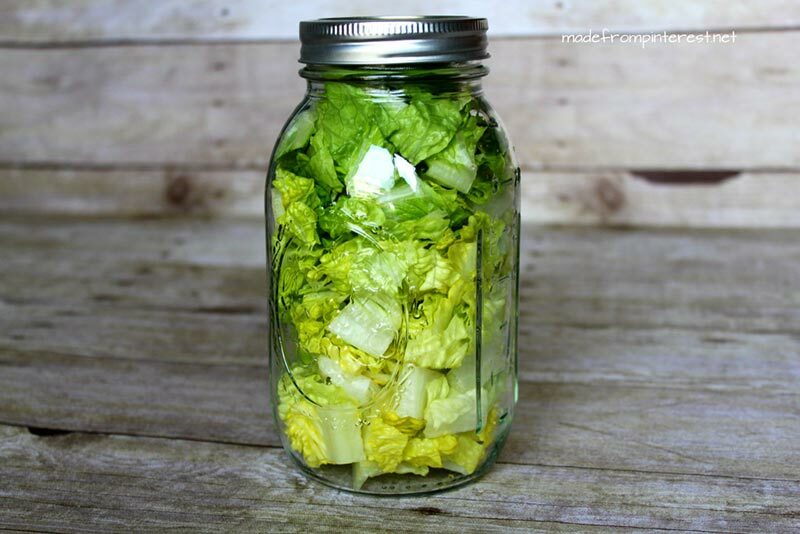 Just put it in a glass jar, pop on the lid and it will stay crisp for up to a month. 22. Grandma had the right idea! 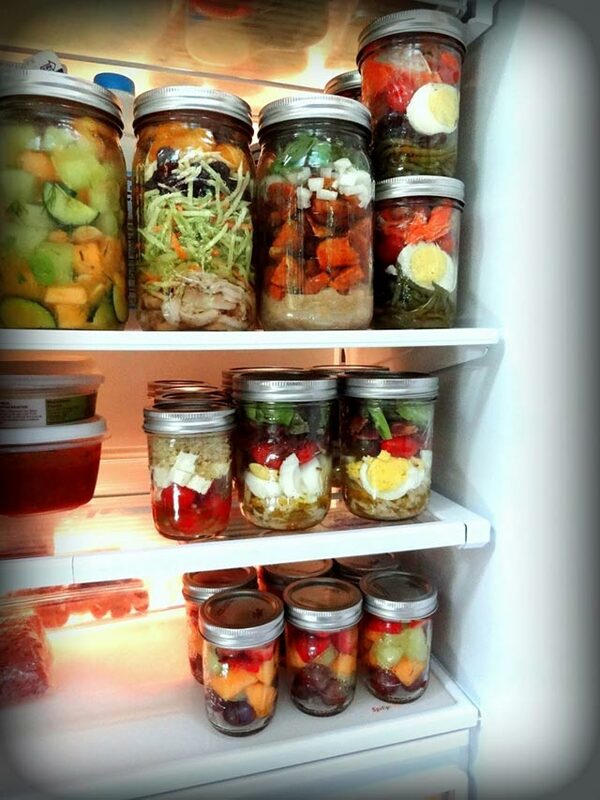 When it comes to storing food, go back to the good old days and use Mason jars instead of plastic containers. They won’t stain and the food will be fresher longer. 23. Freshness is a piece of cake! 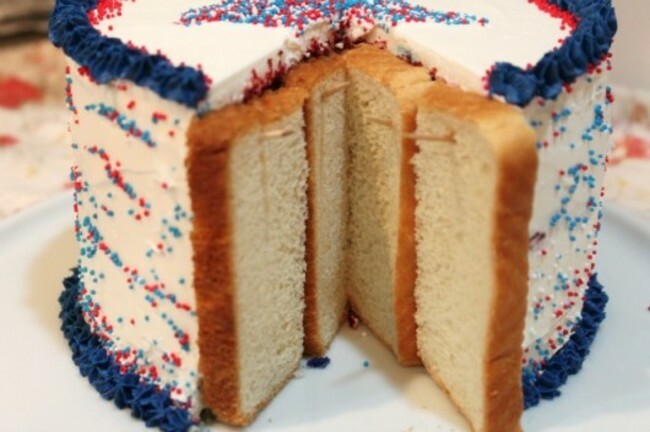 There may be times when you have leftover cake (really?) but there are ways to keep it dessert perfect. It will last several days at room temperature, a few weeks in the refrigerator, and even months in the freezer. To ensure extra freshness, place slices of bread on the cut areas before storing. 24. A mini scallions garden! 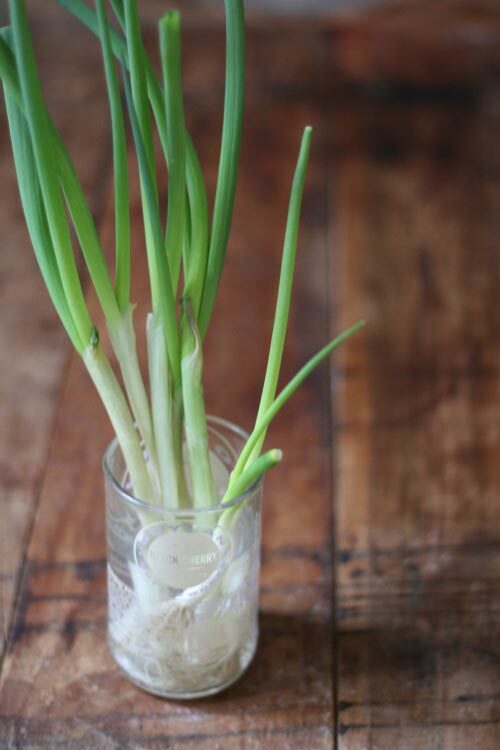 When you get fresh scallions home, simply place them in a glass of water and they will continue to grow, extending the quality and quantity three times longer than simply throwing them in a vegetable drawer. 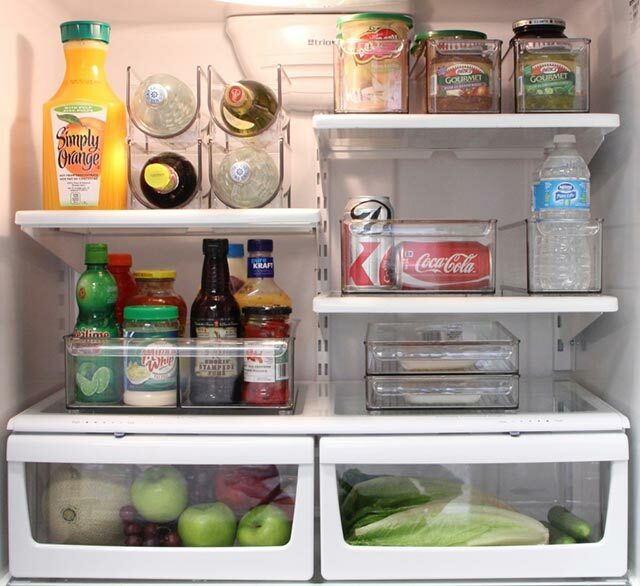 Setting your refrigerator temperature at 36-37*F will extend the life of your stored foods. 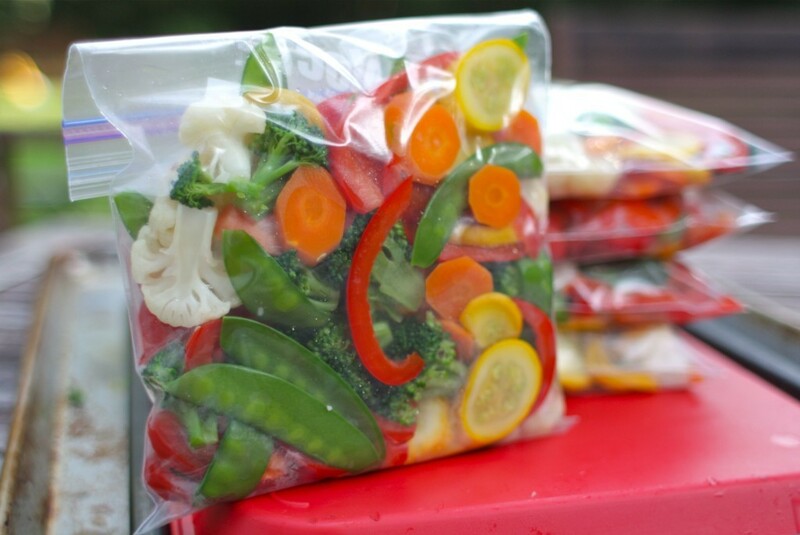 A little ingenuity goes a long way in keeping foods fresh in your refrigerator and freezer. It may take a few minutes more to prepare them for proper storage, but you’ll be happy with the value you’ll receive from being able to buy in bulk quantities. 12 Undoubtedly Smart Kitchen Organization Ideas you need to see now. They will leave you in AWE , so don’t miss them. CLICK HERE to see it. Pictures speak louder than words.